The Deity at Achan Kovil is much different from the legend of Ayyappa. Here Lord Ayyappa is seen with two wives, Poorna and Pushkala in Grihasta Ashram. 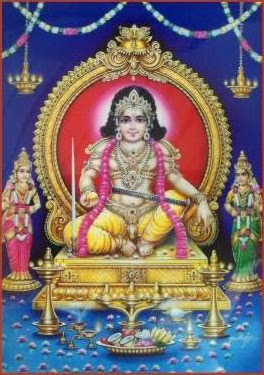 As Lord Ayyappa is seen in matrimony with royal dignity, He is called Arashan and Andavan. AchanKovil Temple is a very important centre for worshiping Lord Ayyappa for Ladies also unlike the Sabarimalai. 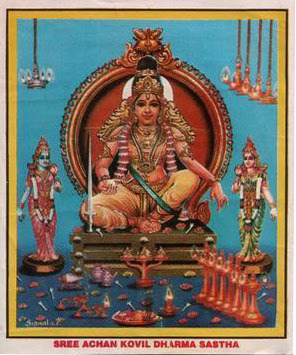 He is called Manikanda Shastha in the shrine of AchanKovil and serves as its king , doctor and saviour in the Ayyappa poongavanam [ the forest of Ayyappa ] marked by the boundary temples in Ranni, Erumeli and Vandiperiyar. Achankoil Shastha Temple, or the Dharmasastha Temple, is one among the five important temples dedicated to Lord Ayyappa in Kerala. Lord Ayyappa leads the Grihastha Ashrama life here – he is depicted as a family man or leads married life here. He is depicted along with his two wives – Purna and Pushkala. It is believed that the idol here was installed by Lord Parashurama. There is a narrow road with steep curves and hairpin bends leading to the Temple, from Shencottah. Two major functions are held in the temple - one is, two days prior to Mandalabhishegam day, when Car festival is held. A sword brought down from Kantha Mala by an ardent devotee of Achankoil Sastha speaks miracles on itself and is regarded as 'Achankoil Pon Vaal' placed for public exhibition on the day of Car Festival. The other is in honour of Swami Krishnaji, who had done yeoman service in bostering this temple, on Revathi star-day in the month of Thai, by offering Pushpanjali to the Lord. Many folk-stories are attached to this temple. Before coming to Sabari Mala, the other temples have their own specialities of attraction. Thagazhi is famous for the medicated oil prepared just in front of the sanctum-sanctorum of the Lord, with herbs brought by men but selected by the Lord Himself rejecting a portion brought by men from the nearby forests Noorani near palghat is famous for its Sastha Preethi and the local belief is that the Lord departs to Sabari Mala alter attending their feast (Sastha Preethi). The Achankovil Sastha Temple is famous for curing poisonous snake bites. The left hand of the idol of Ayyappa at Achankoil Shastha Temple always holds ‘Chandan’ (sandalwood paste) and Thirtha (holy water). The Chandan and Thirtha are considered to have medicinal properties to cure snake bites. The temple complex also contains other deities associated with the Ayyappa legend. The festivals and rituals held here have strong Tamil roots. The most important festival here is celebrated from the first to tenth day of Malayalam month Dhanu (December – January). Achankovil is not easily accessible from all major towns of Kerala. However it can be reached through some forest routes. from Thiruvananthapuram - Take MC road from Thiruvananthapuram to Ayoor. Then take right route to Anchal. Then take deviation to Punalur. Now follow Alimukku-karavoor-Mullumala- Achenkovil forest road. Total distance is 117 km.